On September 11, 2001, U.S. President George W. Bush absorbs news of the attacks in New York for the first time. Many have suggested he was overwhelmed into a state of indecision at the news and should have immediately excused himself from the childrens’ classroom to deal with the emerging crisis. s the 10th anniversary of the 9/11 terrorist attacks approaches, former U.S. President, George W. Bush gives an interview to the National Geographic Channel wherein he maintains his apparent “blank stare” captured on video immediately after being told of the attack on the World Trade Center was actually a deliberate effort to “project calm” amid a developing crisis. The report of the hour-long interview by Reuters also says Bush will outline his thoughts during those first few minutes following his being told the news, and also discusses his approach toward dealing with the aftermath of the attacks in a very candid way. According to the report, Bush brought no notes to the interview and responded to questions without apparent preparation. If true, this piece might actually be worth watching; since one of the main issues many have had with hearing Bush in these kinds of interviews is the very scripted way he has historically responded — ever wary of the political cost of saying the wrong thing. (And in this, of course, Bush is far from alone.) But with the length of time that’s now past, there could be a fresh perspective on his mindset and perhaps even an answer to the question about whether he was really “frozen with indecision” immediately after being told of the first attacks in New York. Those of us who call ourselves ‘reasonable people’ are oft reminded and remind each other that at the core of every questioning of fact is the search for greater truth. It is assumed, indeed, taken for granted that the second-guessing which is part and parcel of higher learning is done in good faith. But what about those who would use this margin to exploit doubt to reach a goal that is other than truth? Perhaps this is the real motive of Nicholson Baker, author of Human Smoke: The Beginnings of World War II, the End of Civilization who casts naked aspersions on the motives of the allies in their struggle with NAZI Germany. Recently held up alongside of Richard Dawkins and other so-called academics to critique that which was once popular, I suppose, Baker has apparently done nothing more than take a series of disparate observations about the possible (and I say ‘possible’) isolated motives of certain protagonists that took the stage in World War II. While some of the observations are valid, even correct – the conclusions either alluded to or outright stated could not be further from the real truth of the matter. And I’m speaking as a student of history on the subject of World War II! Which is why I hasten to add: I suspect Mr. Baker knows it! Were this an honest critique of the characters involved, I’d have little difficulty putting Baker’s work alongside those of other historical works on my bookshelf. But as it stands – this fellow needs to be soundly repudiated, not sounded off in the popular media. Shame on Mr. Baker. Shame on him and on the desecrations of the memory not only of those of whom he is guilty of character-assassinating. On the desecration of the memory of those who fought against Hitler in World War II (like my grandfather) – as being mindless automatons called into service only to serve the alleged petty agendas of self-aggrandizement and naked avarice of those chosen by the people to represent their interests. Surely, sir, the cause deserves a better testimonial than this! Particularly when those interests to which I refer were so very much worse than anything your book levels either as accusation or distortion. Somewhere, perhaps not that far away from where Mr. Baker finds himself sipping a foreign beverage in the company of his fellow dilettantes, those who made the ultimate sacrifice in stemming the evil tide that was NAZI totalitarianism are spinning in their graves. Not at the work itself, but at the notoriety it seems to be bringing Mr. Nicholson Baker. Ironically, the just outcome to this tale is not to leave him to his questioning of those who led and fought World War II for the allies; rather it is to question Mr. Baker himself. His motives. His research. And ultimately, his culpability for an attempt at distorting history. See another critque by Andrew Cohen, at the OttawaCitizen.com website. What Ever Happened to Boston Harbor? Fig. 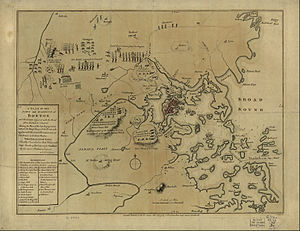 A: A map of the city of Boston, drafted by the British during the American siege of the city during the American Revolution, 1775. Fig. B: A satellite photo of the city of Boston, acquired from Microsoft’s Windows Live Maps service, thumbnail & source image taken April 21, 2008. Fig. C: A high-resolution version of the original map annotated with a coordinate grid for reference. I was browsing some material on the American Revolution this past weekend and came across a map (Fig. A) attached to an article concerning revolutionary military history on Wikipedia. I couldn’t really relate anything I saw in the map to modern-day landmarks (not that I know Boston’s geography all that well, never having actually been there), so I decided to pull up some satellite images of the area on the Internet. Climate change might not be responsible. But I quickly realized the configuration of Boston has changed very dramatically since the days of the American Revolution. That in and of itself isn’t a surprise, perhaps. But if you take a look at one map drafted by a British military cartographer working for General Gage, you quickly realize that the city doesn’t look anything at all like that today. The initial explanation one might well reach is that the abilities and technology available to cartographers of the period contrast sharply with today’s satellites and GPS systems. Perhaps the inaccuracies the legend of the map (Fig. A) itself describes are a result of this. But even in 1775 when the map was created, there couldn’t have been such extensive errors made capturing the likeness of the terrain. As its function was military, it would hardly have served, for example, to depict only one obvious land route into Boston from the south as a small isthmus referred to at the time as "the neck" obviously refers to there being an abundance of water on both sides of the land formation (just west of grid marker H4 in Fig. C). But if we refer to the satellite image, it’s clear there’s a lot more land in the vicinity and to the south of old Boston now. "The neck" and the road depicted running along it on the old map may well be what is now called Hudson or possibly Lincoln Street. It seems safe to suggest that most of the area directly west of the Boston Common today, was either swamp or completely under water when the English found themselves besieged in the city, back in April 1775. Note also that the configuration of the harbor itself has changed very dramatically over the last three centuries. If one visits the Windows Live Maps site and pulls up old Boston, the islands that used to exist in and about the harbor are mostly gone. (It’s also readily obvious that Boston’s Logan International Airport is completely man-made terrain; literally landscaped right out of the harbor!) Referring back to the annotated map (Fig. C, left), we can see no island whatsoever at grid reference points I5 and just southwest of J6, also formerly known as Noddles and Hogg Island, respectively. Each appears to have been annexed into greater Chelsea and been colonized by those fleeing the urban congestion of neighboring Charlestown. Okay, this might not be cause for too much excitement, but I do find it fascinating that in a little over 250 years, the city that was once surrounded almost entirely by water has seen its landscape change so dramatically. Most of the work to turn harbor into land that could be occupied and built upon took place long before the dawn of the 20th century too. Which means a lot of hard work went into claiming space from the sea. And it also explains why maps of the revolutionary period might not look anything like Boston today – so much so that at first glance you’d otherwise not know it was actually a likeness of Boston at all.